Catalogue of Organisms: Taxon of the Week: Cotinginae – Neotropical and Fabulous! Taxon of the Week: Cotinginae – Neotropical and Fabulous! Sure you said just fluffy, but did you ever imagine I could do this with your hair? When I used to look through one of the various bird family books I knew and loved as a young'un, the cotingas were somewhere I was bound to stop. 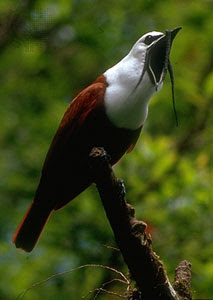 Cotingas are a diverse family of largely frugivorous birds from Central and South America. Don Roberson refers to them as the "birds-of-paradise of the New World", and while perhaps not quite so incredible as the original birds-of-paradise, cotingas are certainly up there (along with hummingbirds and pheasants) in terms of total drag-queen-esque gaudiness. 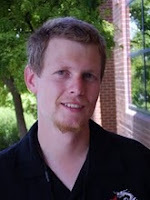 Preliminary phylogenetic analysis by Prum et al. (2000) divided the Cotingidae into four reasonably well-supported clades, though relationships within the clades were poorly supported. Prum et al. suggested that these clades be recognised as the subfamilies Tityrinae, Phytotominae, Rupicolinae and Cotinginae. A more recent analysis by Ohlson et al. (2007) effectively supported Phytotominae and Cotinginae, though the Rupicolinae of Prum et al. 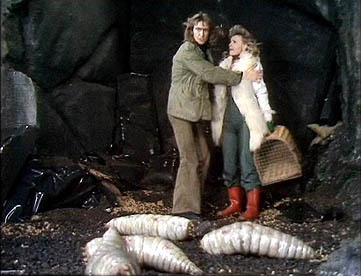 (2000) were polyphyletic. Authors differ on whether the Tityrinae should be included in the Cotingidae or not, and Ohlson et al. (2007) excluded them. It is with the Cotinginae (the "core cotingas" of Ohlson et al.) that I am concerned today. The name "cotinga" is actually a rather inappropriate one. It comes from a native Amazon name for one of the species meaning "washed white" (Austin, 1961). Despite this, only a few species of cotinga are significantly white, including the bellbirds of the genus Procnias (male three-wattled bellbird, P. tricarunculata, at left from Encyclopaedia Brittanica). Bellbirds get their name from their bell-like call (a single "bock!" according to Don Roberson), which is reputedly one of the loudest sounds made by any bird. Ohlson et al. 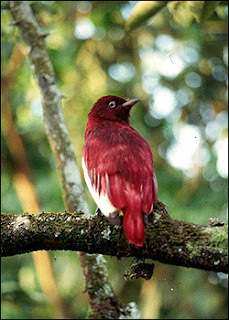 (2007) placed Procnias in a clade they referred to as the "canopy cotingas", which also includes (among others) Gymnoderus foetidus (the bare-necked fruitcrow) and Carpodectes nitidus (the all-white snowy cotinga). The genus Cotinga has traditionally been regarded as closely related to these genera, but Ohlson et al. were unable to confirm such a relationship. Going by the results of Prum et al. (2000), the canopy cotingas probably also include Xipholena punicea, the pompadour cotinga (shown above in a picture from the Field Museum). This species received its common name from Jeane-Antoinette Poisson, Marquise de Pompadour, she of the gigantic and ridiculously ornate wigs. Among the exotic paraphernalia Madame de Pompadour incorporated into her stupendous wigs were whole birds, and the first described specimen of the red lavender-coloured pompadour cotinga was described from a shipment of bird skins captured by the British on its way to the Madame. The two groups of pihas are quite dull-coloured birds, though the screaming piha (Lipaugus vociferans) makes up in volume what it lacks in colour. All pihas were once included in a single genus Lipaugus, but Prum (2001) showed that the two species of Snowornis were not closely related to the other pihas. Finally, the fruitcrows include the largest of the cotingas. Many of the fruitcrows and the Lipaugus pihas are lek breeders (the fruitcrow genus Querula are monogamous with nest helpers, while the breeding habits of Snowornis pihas are largely unknown but have not been observed to include lekking). 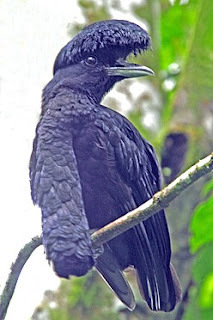 The best-known of the fruitcrows are undoubtedly the spectacular umbrellabirds of the genus Cephalopterus with their bouffant hair-dos and long, hanging throat sacs (shown at the top of this post in a photo from BirdQuest). But just as notable is the calfbird (Perissocephalus tricolor), whose cow-like call is accompanied by a strange movement of stretching the neck, puffing the feathers around the head and tottering precariously on the legs. See for yourself! Ohlson, J. I., R. O. Prum & P. G. P. Ericson. 2007. A molecular phylogeny of the cotingas (Aves: Cotingidae). Molecular Phylogenetics and Evolution 42 (1): 25-37. Prum, R. O. 2001. A new genus for the Andean green pihas (Cotingidae). Ibis 143: 307-309. Prum, R. O., N. H. Rice, J. A. Mobley & W. W. Dimmick. 2000. A preliminary phylogenetic hypothesis for the cotingas (Cotingidae) based on mitochondrial DNA. Auk 117 (1): 236-241.